Battles Magnesium Sulphate (also known as Epsom Salts) has a wide range of uses in the equine industry including to prevent obesity, laminitis, poor general condition, over-excitedness, nervousness and muscle tremors. Suitable for all-round veterinary use, this concentrated salt is a quality source of Magnesium also widely used as a laxative. 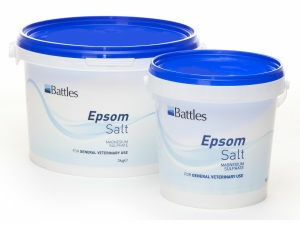 Below are some recent questions we've received regarding Battles Magnesium Sulphate (Epsom Salts) for Horses, including answers from our team. Some nervous, excitable horses do seem to be better when given a magnesium supplement, so this product could be worth trying in your horse. I do not think it will have any direct effect on ulcers affecting the stomach lining, but if your theory about stress is correct at all, then it might help indirectly. Personally I would not be confident it will work like that but it is unlikely to cause any trouble. I would be tempted to try something like Protexin Acid Ease as this is more likely to help overall. One large tablespoonful per day is OK. If you give much more than this it can start to act as a laxative. The maximum amount would be one tablespoon per 100kg bodyweight.